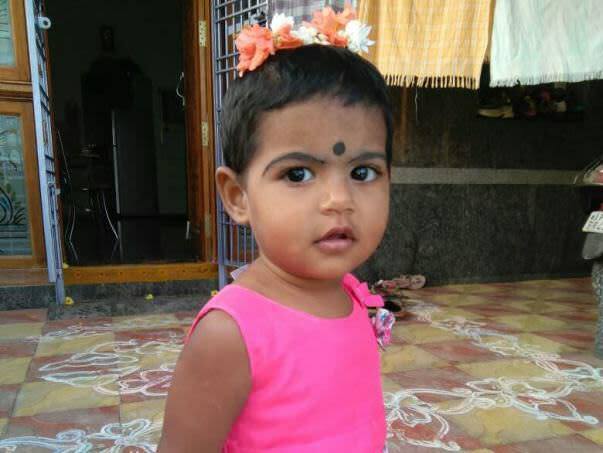 My 1-year-old daughter Nithya Sree was born perfectly well. It is a motherly instinct to protect the children and give them all the care. I was doubly careful because I do not want my children to feel the pain of growing without a father. I was determined to raise them as happy and healthy children. My husband left us as soon as she was born and never turned up till now. When he left me I felt the world is completely shattered, I thought I was totally lost but my children gave me the reason to live. I live in Tirupathi, Andhra Pradesh. I have been through the worst in my life but I managed to gather all my strength and faced it, the reason is my children. I live only for them. Fate is so cruel, now it wants to take my daughter also away from me for whom I live. From where can I draw the strength to see my daughter battling for her life in pain all the day? A month ago, my daughter got a high fever, cold, cough and breathlessness. I was terrified, I rushed her to hospital. I can't forget that day. I cried all the way and prayed that nothing should be serious. Doctors said she has a viral infection and was taken to ICU. By that time, she completely lost her consciousness and tests confirmed that she has liver failure. 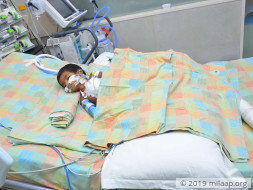 She needed respiratory support with medicines to cure the liver problem. Even before I could understand what was happening, I heard the most unimaginable one by one. My daughter has multi-organ failure, in a blink of an eye, her heart, brain and lungs were also affected. 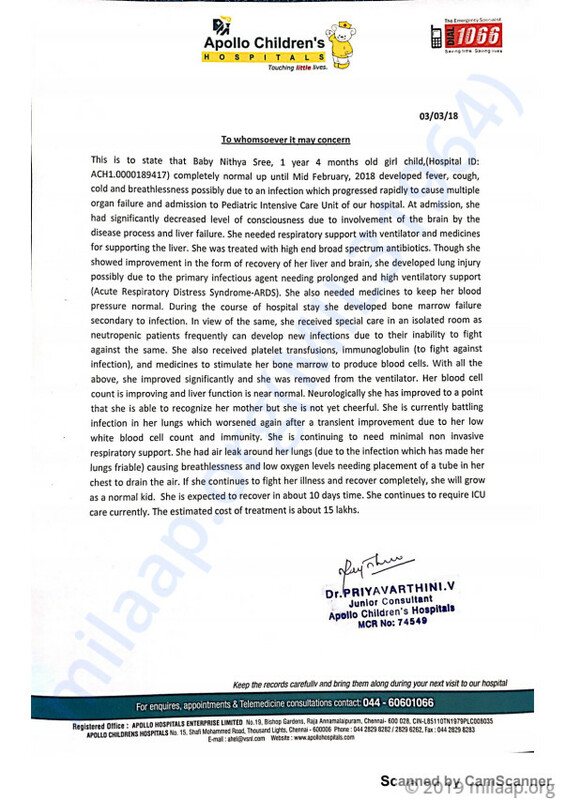 She also developed bone marrow failure.She is given medicines to keep her blood pressure normal. She is just one year old, can't imagine what she is going through. 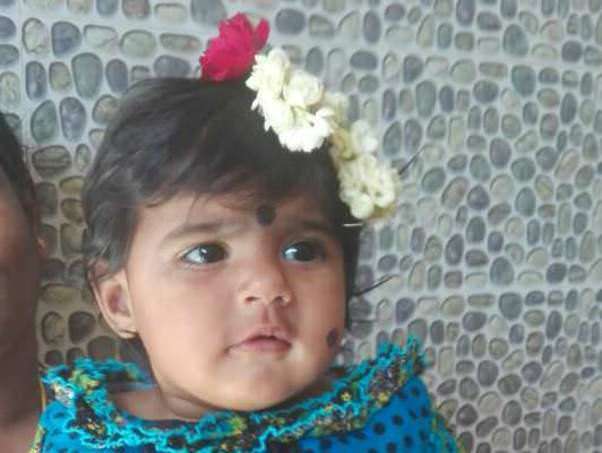 I first took her to a local hospital, then doctors asked me to take her to a hospital in Chennai. I came all the way to Chennai with my 4 -year old son Varun. He doesn't move from me even for a second. He doesn't sleep without me. She is removed from the ventilator, she is able to recognise me but she all I could see is pain and fear in her eyes. She is not that cheerful kid anymore. She is now battling an infection in her lungs which worsened after a transient improvement. She has a long way to go. I'm desperately waiting to take her back home. My son and I are now staying in the hospital room. 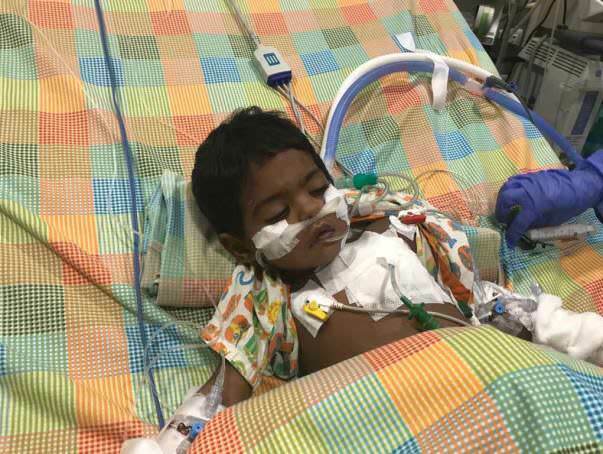 Varun cries all the day, he is sick of the hospital atmosphere. He is pleading to take him back home not knowing that his little sister is fighting for her life. We need to be here for at least 10 more days. 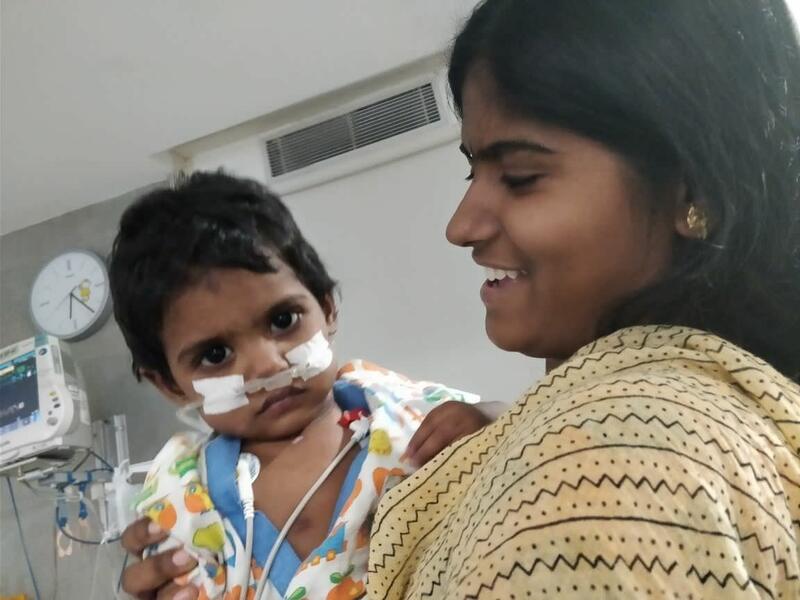 She has to fight all the disease and recover completely to grow as a normal child. I can't imagine going back to home without her. I'm nothing without my children. I have no reason to live without them. My parents are in the village, my father is a farmer. At this age, he is struggling to take care of me and my children. They are living hand to mouth, yet he is trying his best to send some money. I skip my meals to save every penny. How can I not feed my children? I borrow money even to feed them. I have sold everything I had. I cannot bear if I lose my child, my guilt will kill me. I can work until the end of my life and raise them, but she needs to be alive and normal. 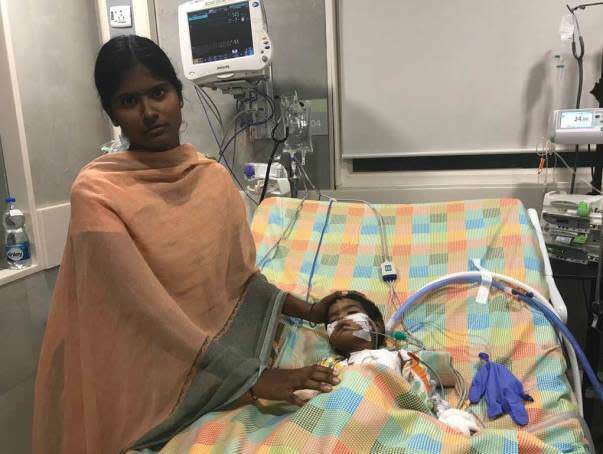 She requires ICU care and the treatment costs Rs 15 lakhs. How can I earn so much money? How can I lose my child just because I don't have money? Thank you for the wonderful support that you have shown towards Nithya Sree. Your overwhelming love and support towards her helped us in this difficult time. She was one of the sickest the PICU team managed, and the multiple organ failures made the process of the treatment even further critical! Today, we are very happy to share with you that she will be going home completely cured tomorrow, and it absolutely wouldn't have been possible without your help. She has been stopped of oxygen inhalation and is able to breathe normally. She is also taking feeds normally. She is active, alert and responding normally to her mother. Her mother just can't stop smiling! Much gratitude to the whole team and all the supporters. It means a lot to all of us. Do pray for her health and speedy recovery. Thank you for the support that you have shown towards Nithya sree. 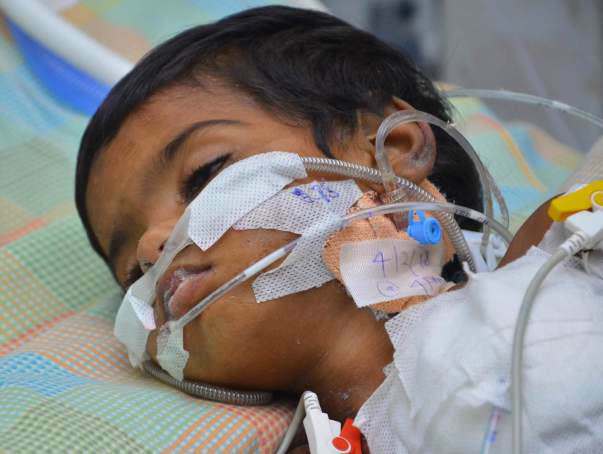 She is being treated with non-invasive ventilation as her lungs have not recovered fully. She is also on a broad spectrum of antibiotics and antifungals to treat her infection in the lung. She has a persistent air leak from her left lung as her lungs are still friable and she has a tube in her left chest in view of the same. She is slowly improving but is still not out of danger. She can develop a life-threatening air leak around the other lung too which would need immediate chest tube insertion on the right side and drainage of air. Her bone marrow has recovered and liver function is near normal. 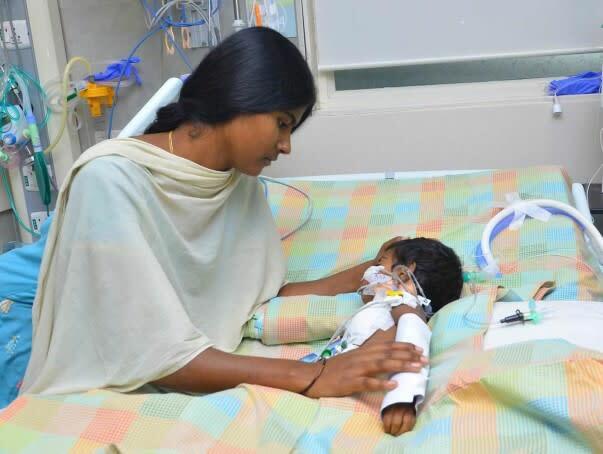 She is conscious, recognises her mother but not yet cheerful as her lungs are still in the process of recovery! We are hoping for a full recovery in the next one week! Thank you all once again for the wonderful support. Please do pray for her health and speedy recovery. Will keep you posted.